June, for us in Tokyo, marks the arrival of the month-long monsoon season, which itself is the beginning of the muggy, steaming summer that lasts well into the middle of September. As much as I seriously wish I could sleep through the entire summer in aestivation, I can't help but get excited with all the fruits that come around this time of the year - from cherries and plums, peaches and nectarines, and blueberries to lychees, melon and watermelon, and then grapes and pears (the kind that you may know as nashi or Asian pears), as well as prunes (a.k.a. Italian or French plums) that arrive at the very end of summer. Dominating the store shelves during the whole month of June, of these, must be cherries. Like peaches and melons, they often appear on the store shelves as an item for gift, neatly nested in a beautiful box (like ones you can find here) with a matching price tag - which, in fact, used to be how I always saw them when I was growing up. The cherry season would be very short, and when they did come they'd look (and cost) like precious gems. 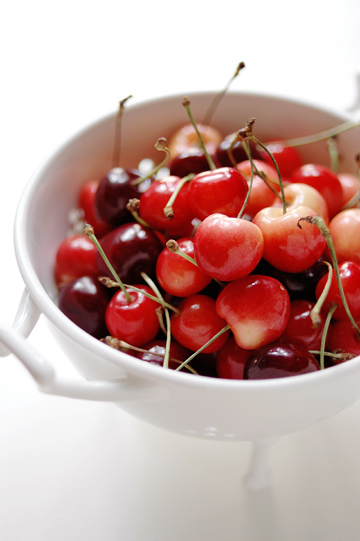 Cherries are expensive, it was so ingrained in my mind forever. They, like peaches and melons, never used to be a regular in our fruit basket at home. Well, we did have peaches a lot, actually; they could be reasonably priced at the height of their season, and we all loved peaches in our household so we'd treat ourselves to the occasional indulgence. And cherries, too, may have been reasonable at times - but I just don't remember eating them that much as a kid. And quite frankly, I didn't see what the cherry hype was all about. I never really had a chance, or willingness, to get to fully appreciate them. Then there came what we called (and still call) 'American Cherry'. Also called 'dark cherry', they are all imported from - gasp! - the USA. 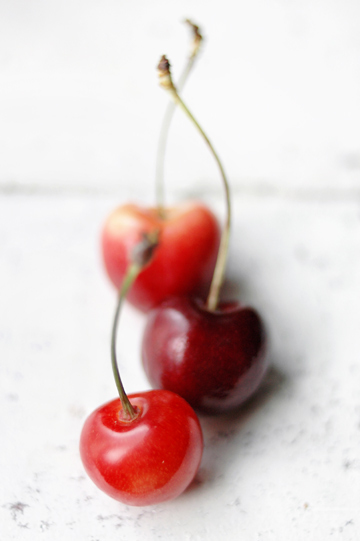 For most of us the public, there were basically only two kinds of cherries: pinky red domestic cherries, or sakurambo in Japanese, and dark-colored American cherry, which is what is known as Bing. As far as I can remember, they would generally be cheaper than the domestic kind, and they are actually more to my taste. Domestic cherries, to me, are often a little too soft and squashy to my liking. That might have been because I'd always eat a cheap, less-than-stellar lot, though. Who knows, if you send me a box of top-notch sakurambo worth 5,000 yen ($50) or so per pound, I might change my opinion. Many Junes have come and gone since my cherry-deprived childhood, and now my world, in terms of cherries, has expanded quite a bit. For one, domestic cherries have become fairly inexpensive compared to how they used to be; more precisely, there is a wider price range to choose from. 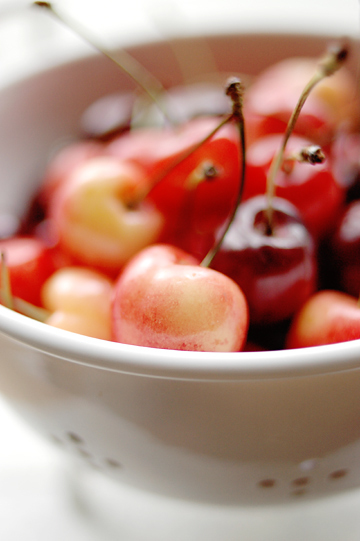 Expensive cherries still are expensive, but you now have cheaper ones around. 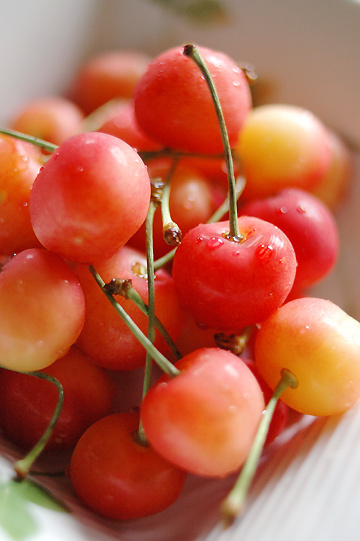 And there is now another kind of American Cherry that is imported to Japan: Rainier. It's been only a few years since I first saw them around in department stores and supermarkets in Tokyo, and they are never exactly cheap, but it's good to have a new option outside of the rather simple Japanese vs. American choices. Rainier is closer to Japanese sakurambo than Bing is both in appearance and taste. Rainier may in general be bigger, but sakurambo can also be quite large. What I think may be the largest difference between the two pink cherries is the texture; Rainier has firm and crunchy flesh similar to that of, say, nectarine, while sakurambo is more on the soft and plump side - kind of like plums. And I can't help but loving Rainiers - if only they could come a little less expensive, I could almost entirely forget about sakurambo and would happily devour Rainiers (and Bings) throughout the month of June. Now it is almost mid July and it feels strange to repeat the word 'June'. The thing is, I wrote a half of this post in the middle of June and never quite got around to finishing it...until now. 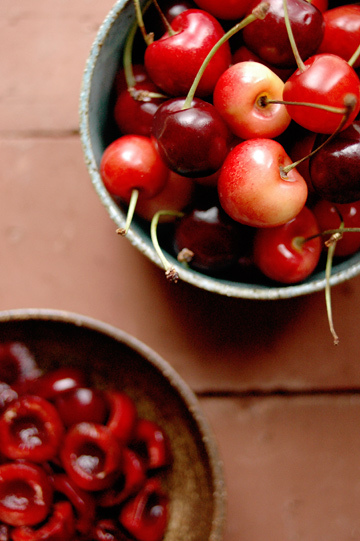 Now that cherries are being gradually replaced by peaches and melons at the store, I'm hurrying up to share a few of my favorite ways to eat cherries - other than popping them into the mouth straight from the bowl, of course! First hit of the season for me was tiramisu; Cherry Tiramisu, that is. I first made it for my sister's birthday early last month. I try to make something for her birthday when I can, and I'd usually ask her what she would like. Over the past decade or even longer, her answer has been quite predictable; it's more often than not New York-style cheese cake, or tiramisu otherwise. For this year I went ahead and bought ingredients for the cheese cake. A couple of days before her birthday, though, I thought I'd ask her just in case. "Well, I'd like the cheese cake", she said, as expected. She meant her favorite NY-style cheese cake, of course. Easy. Then she went on: "And tiramisu". Excuse me? Are you telling me one birthday cake isn't enough? Hey, don't be greedy - you've gotta choose one, I demanded. "What!? Okay then, mont-blanc, too", she replied, grinning. Punk. On her birthday, my sister had tiramisu for breakfast and went out dressed in a smart kimono to see kabuki - how chic is that? I promptly dismissed her third request because the chestnut dessert is a little too elaborate for me to make (I did make one for her a long time ago when she visited me in Hawaii), but decided to make (part of) her dream come true and make both cheese cake and tiramisu for her. She must have seen a halo over her little sister's head. 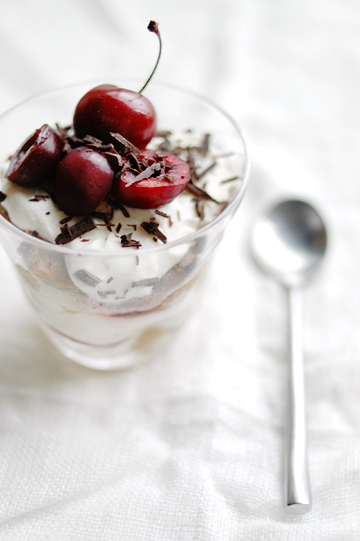 And since I had a lot of cherries in hand, I decided to make cherry tiramisu. I didn't have any specific recipe in mind, but sort of make some up by combining components of tiramisu: mascarpone cream and ladyfinger biscuits dipped in coffee syrup, plus cherries. I wanted to keep things as simple as possible, and made the cheese cream mixture without eggs - and sugar, even. What I did was to sweeten some softened mascarpone with a bit of honey, and fold in lightly whipped heavy cream. I aimed for 2 part mascarpone and 1 part heavy cream. For the cherries, I don't particularly fancy stewed cherries, but thought I'd cook them a bit just to make them slightly tender (so they'd mingle well with other components) and give off some juice. First I pitted and quartered cherries, then tossed them with a bit of honey and white wine. (I would have liked to use some stronger, more flavorful liquor such as Kirsch, but I didn't have any at hand). I cooked them briefly in the microwave (a few minutes in a pan over a medium heat would do, too), and left them to cool. When the cherries were cooled to room temperature, I strained them over a sieve and added all the liquid to strongly brewed coffee to make the coffee syrup. You'd want to use espresso if you have equipment, which I don't. At least I ground my own beans! 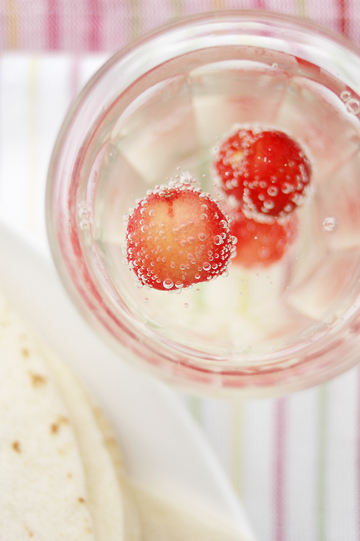 Once both the cherries and syrup were at room temperature, I went on to put everything together - lining the bottom of glasses with ladyfingers dipped in the syrup, topping them with a few cherry quarters, and then with the mascarpone mixture, and repeating it to fill up the glass, finishing with the cream. Now you'd chill them for a few hours, and just before serving them, top each glass with a few halved and whole cherries (as you like) and some shaved chocolate. You can chill them in the fridge, but I like to put them in the freezer, and thaw them a little in the fridge half an hour or so before serving - it's a tip from my friend Taeko, who's authored two Italian cookbooks both of which I love. As I was making the tiramisu, I kept thinking about something I used to make a long time ago. 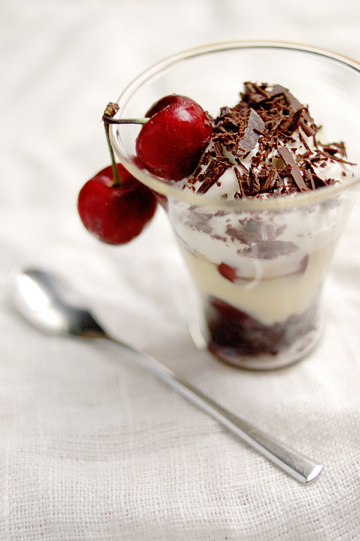 It was a dessert called Black Forrest Trifle, from one of the early cookbooks by a prominent Japanese baking book author Makiko Fujino. The idea is to make trifle, a quintessential English dessert consisting of custard, fruit and sponge - using cherries and chocolate. You make trifles by layering these ingredients, which seemed very much like tiramisu to me. 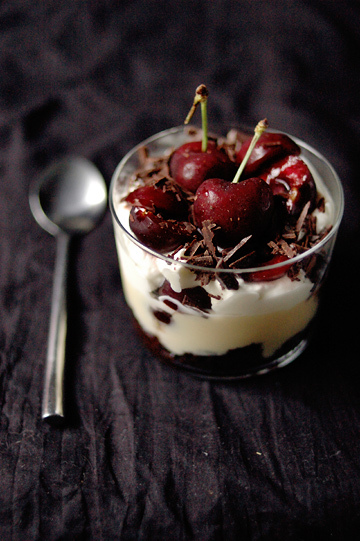 Now you may or may not be familiar with the cake called Black Forest Cherry Cake. I don't remember how I first came across this traditional European cake, but it was introduced to me as schwarzwalder kirschtorte (which literally translates to Black Forest Cherry Cake). The ones I knew back then as a teenager were made with canned sour cherries, and it was about the only thing I liked that was made with cooked cherries. I remember making the cake often, all year around, in the summer and in the winter. I'd make one in a traditional layer cake-style, or sometimes in the form of a swiss roll (making a sheet of cocoa sponge and roll up cream and cherries). But the idea of making it into a trifle had never occurred to me until I saw it in the said Makiko Fujino book; in fact, I wonder if I had even known that a dessert called trifle existed (mind you, it was a loooong time ago in Japan!). Then for quite some time I didn't make it - both the cake and trifle -, but I'd thought about it every year when I saw cherries in storefront. And several years ago I finally made it for the first time in a very long time - and it was for my recipe column I had on a local Hawaii newspaper. I made my version and tested it, so I have a very specific recipe. But when I decided to make it this year, I almost completely ignored it and made a 'cheat's' version - by making both the custard and sponge (and oh, the syrup, too) in the microwave. My excuse is that it was too hot in the kitchen to turn on the stove or the oven, but I wouldn't say anything if you think I was just simply being lazy. For the cocoa sponge, I turned to my own microwave chocolate cake recipe that I made a long time ago. (I haven't been making it so often these days, but when I do it still seem to work okay.) For the custard, I used a recipe for microwave custard (in Japanese) that I found on the web; you'd probably find some in English if you give it a search throwing in words like "microwave custard" or "microwave pastry cream". Alternatively, you could use a ready-made custard (not too runny one), or make it with a store-bought custard mixture. OR you can of course make both the sponge and the custard in the old-fashioned way, using the recipe that you trust. Whatever you do, add a little Kirsch to the custard when it is cooled to room temperature. While the cake is cooled to room temperature and the custard is chilled in the fridge, you prepare cherries and make syrup, both of which are, again, an easy job. You'd just halve and pit cherries, and add a small spoonful or so of Kirsch (cherry brandy) and let them sit for a while. As for the syrup, it's really simple - you'd make a simple syrup (1 part each of sugar and water), and add a bit of Kirsch. Then finally, you'd prepare the cream by whipping some heavy cream - again, with a splash of Kirsch added at the very end. Like tiramisu, once you have all the building blocks - cake, custard, cream, syrup, cherry filling and chocolate - ready, all you need to do is building your trifle with them: place cake pieces in the glasses and spoon over some syrup; scatter some cherries and shaved chocolate; cover with custard; top with whipped cream; and finish with whole and halved cherries and more shaved chocolate. I really didn't take detailed note for this one and can't give you a precise recipe, but here is a list of ingredients for your information - but again, if you have a recipe you normally use for the sponge and custard, by all means use them. ** I used 2 egg yolks, a little more than 3/4 cup / 200 ml whole milk, 2 Tbs. pastry flour (sifted), 1/4 cup (4 Tbs.) granulated sugar, and 1 Tbs. / 14 g butter. *** Heat together 3 Tbs. each of granulated sugar and water in a pan over medium heat and boil for a few minutes. Let cool. Please note that the amounts are approximate - you'll likely have some leftover (or make more). Now I won't be surprised if, by now, you feel a bit frustrated with this lack of 'complete' recipes here. For which I apologize. 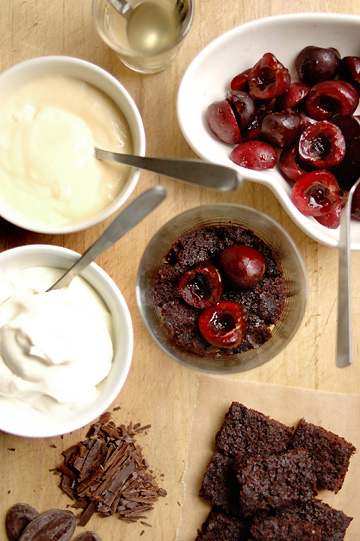 But good news is, there are a couple of other brilliant cherry things that I tried this year, for which you have good recipes to turn to. 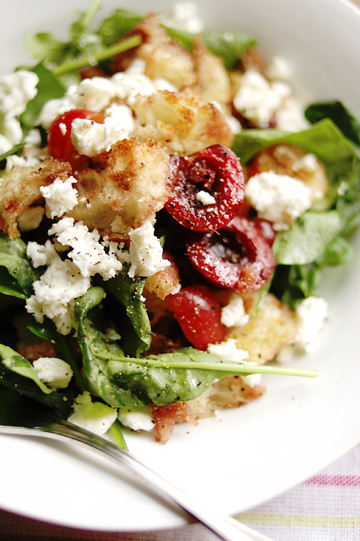 One comes in a form of salad - called Bread Salad with Cherries, Arugula, and Goat Cheese. It was one of the first recipes I tried from the book A Homemade Life: Stories and Recipes from My Kitchen Table (Simon & Schuster, 2009), by Molly Wizenberg - who, of course, is best known for her blog Orangette as well as an array of other publications. A lot of recipes included in the book can be found on her blog, but this particular one seems to appear only in the book. This salad alone can be a reason to buy the book, if you ask me - although I don't think you'll have a hard time finding more reasons to do so, with so many appealing recipes nestled between Molly's tales of her gushing but sweet love for food and family. About the salad - while the name of the recipe kind of tells it all, but the resulting salad was way better than what you might think as a mere sum of the ingredients. It basically is a combination of garlic bread pieces and cherries, but when the garlicky bread soaked up some juice of cherry along with olive oil and balsamic vinegar, it was like a magic - I never knew cherries would go so well with garlic bread! I'm looking forward to making this again, maybe next year (for now I'm too busy trying her other recipes in the book). 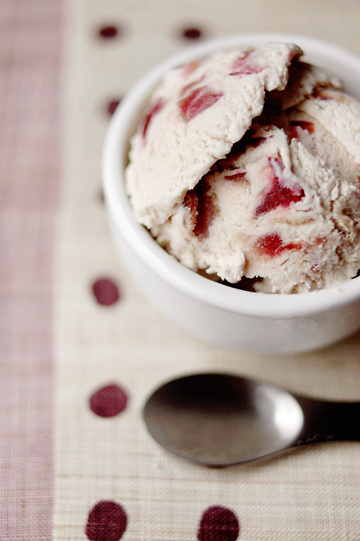 Now back to sweets - how about some sweet cherry ice cream? 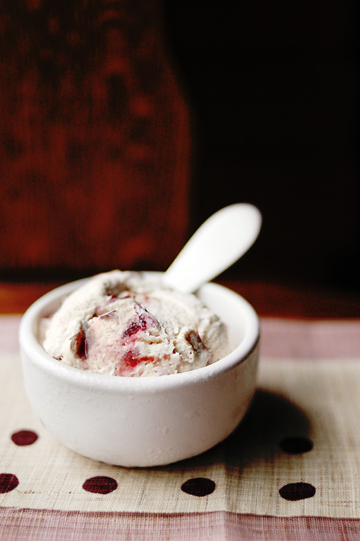 Studded with chunks of cherries, this was one gorgeous and pretty ice cream - if you are not convinced so, head over to Heidi's post for the real deal (both picture and recipe). In addition to being so moreishly delicious, it happens to be incredibly easy to make, too - it's one of those eggless ice cream, with no sugar added, either. I basically followed the recipe, except that I didn't use an ice cream maker, because I don't have one. I used my usual 'whiz-them-in-a-blender' method, but with an extra step this time. What I did was this: once the ice-cream base was thoroughly chilled, I strained it over a sieve to separate the cherries and the liquid. I processed the liquid in the blender to lightly whip it, and put it in the freezer, while reserving the cherries in the fridge. When the ice-cream base was partially frozen, I gave it another whiz in the blender, and then put the cherries back into the mixture, and froze them until set. I know this might sound like an extra trouble, but it really wasn't; you'd just have an extra bowl and a sieve to wash, that's all. I just wanted to make sure the chunks of cherries hold their shape, so I didn't process them in the blender. It's completely unnecessary if you use an ice cream maker, of course. I've already made this three times so far, each time with different liquors - first amaretto, then brandy, and lastly lychee liquor (not the one I made myself - it's not ready! ), all of which turned out good. And I don't see why I shouldn't be making this again - it's getting warmer and warmer here these days as we move toward the end of the monsoon season, and I find myself peeking into the freezer for something nice and icy more often every day. While I'm sure I'll be making a bunch of ice cream over the coming months, I should savor every last handful of cherries while I can. To me, when there are no cherries seen at the store towards the end of July, that means the dreadful summer really, finally is here with us. hello chika-san, your monsoons are here on guam, it is so gloomy and rainy that i failed to find joy in the 2 kilos of cherries in my refrigerator. but now you have inspired me, thank you! How much I like your style, photos and words! I've told you, I know :) The idea of tiramisu for breakfast is very tempting especially if it's this kind of tiramisu. 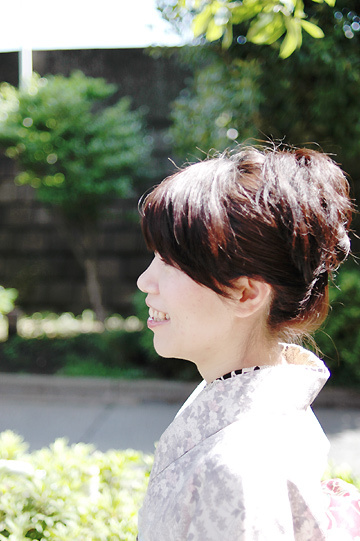 I love your photos and your blog.. I also just finished reading Molly's book, and can't wait to try the salad, thanks for the picture! Hi there, thanks all for your comments! Amber - I think I'll just have to be in Seattle (and the rest of the Pcific Northwest) this time of the year - weather's lovely and oh, Rainiers! 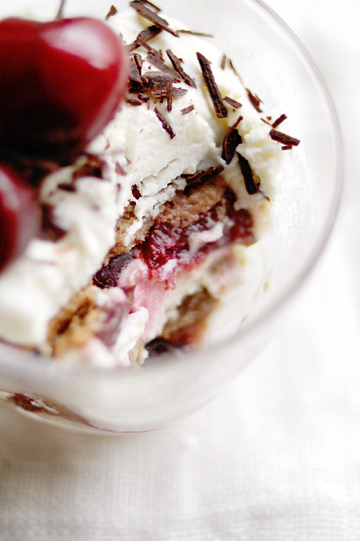 cherry tiramisu ha? who would thought about i? and that salad looks awesome too!.